Contents and Media: Six parts in pale yellow resin; instructions. Advantages: Beautifully detailed and perfectly cast; natural drape on harnesses; authentic and intricate quilted backrest. Conclusion: I have always liked the idiot-proof and very natural drape of harness straps when they are cast in place. This is a simple yet highly desirable upgrade for your Eduard Tempest. 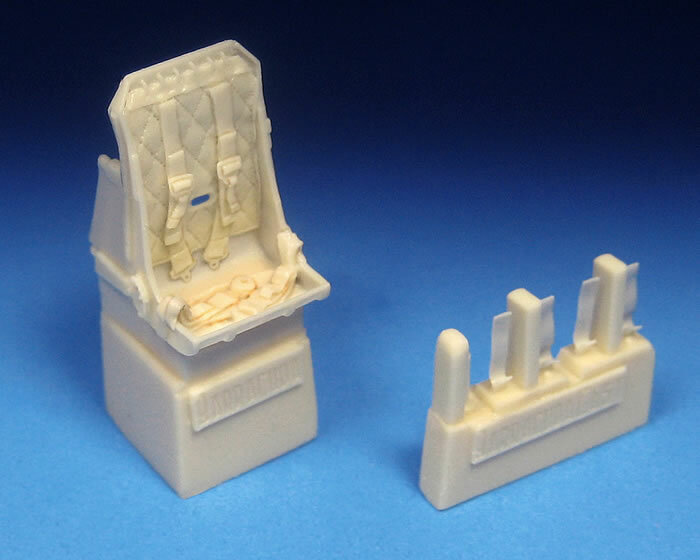 BarracudaCast has released a range of Hawker Tempest accessories and upgrades just in time for the new Eduard 1/48 scale kit. Tonight I am examining Item No. 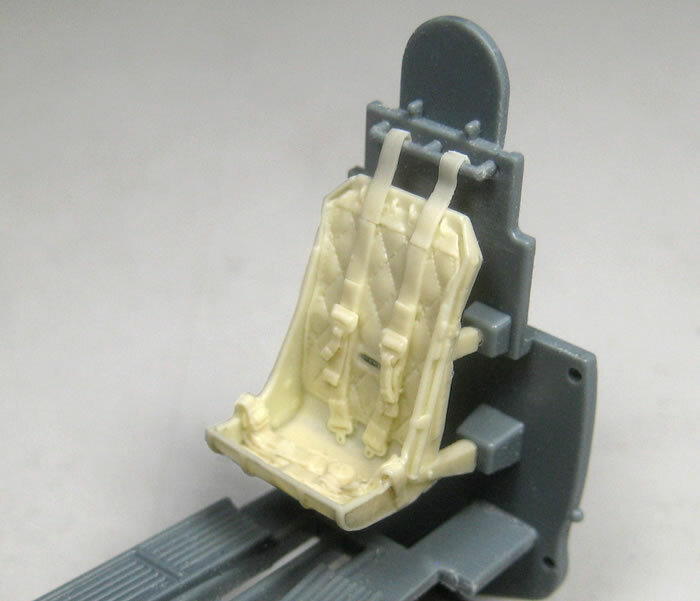 BR48397, 1/48 scale Hawker Tempest Seat with Belts. 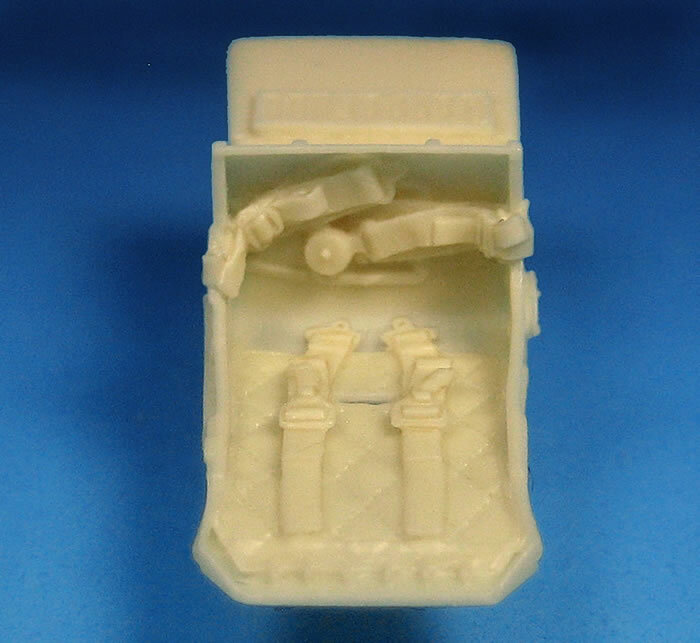 This resin seat is supplied as one main casting with the backrest cushion, lap and main sections of the shoulder harness cast in place, plus four short upper belt sections (two are spares) to loop over the horizontal bar behind the pilot. The instructions also suggest that you can make the upper belt sections from wine bottle foil if desired. Detail on the seat is exquisite, with deep, authentic quilting on the backrest, visible stiching around each quilted diamond, loop mounts at the top of the backrest, crisply cast hardware on the belts and much more. Instructions are supplied on a small folded piece of paper with step-by-step text and full colour images. The instructions point out that the seat casting is fragile, so do take care when removing it from its block and cutting out fine areas of flash. I have always liked the idiot-proof and very natural drape of harness straps when they are cast in place. This is a simple yet highly desirable upgrade for your Eduard Tempest.